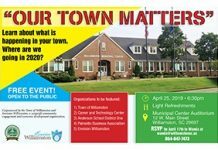 In preparation for a Comprehensive Plan for the Town of Williamston, a Strategic Assessment Site Visit and various community meetings will be held on May 4 and 5 to obtain input from residents, businesses and community leaders. 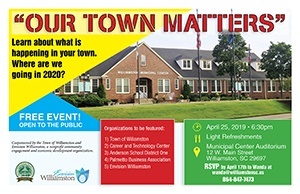 Community Meetings will be held at Williamston Town Hall and anyone interested in the future of Williamston is invited and encouraged to attend. Residents of the Brookdale Community and the Mill Village Community are invited to offer input Monday (May 4) at 6:30 pm. These meeting were originally scheduled to be in the Williamston Municipal Center (Tawn Hall) however Brookdale will be at the Caroline Community Center. 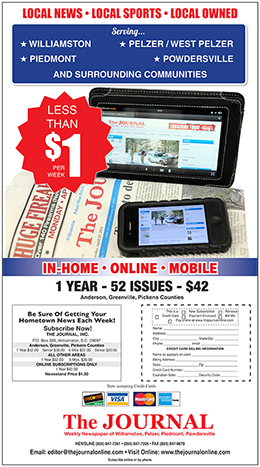 The Williamston Mill meeting will be held at Calvary Baptist Church. A community wide town hall meeting will be held on Tuesday (May 5) at 6:30 pm at the Municipal Center. 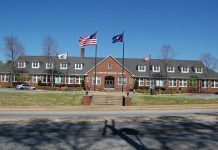 In February Williamston Town Council approved $75,000 in funding for a comprehensive Master Plan and an additional $25,000 for implementation of the plan. 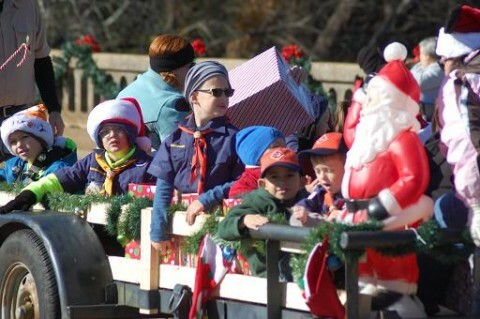 Representatives of Arnett Muldrow will be gathering information and creating the Master Plan for the town.